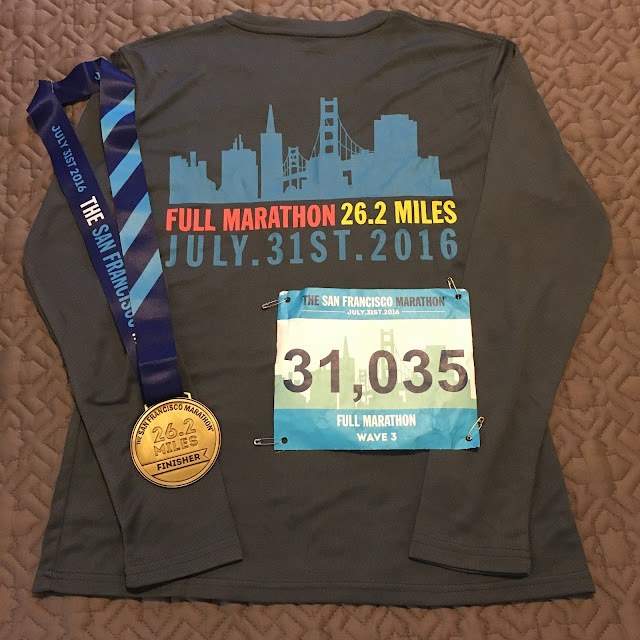 On July 31, I ran the SF Marathon as a long training run for Tamalpa Headlands 50K. As you may know, I had not been planning to run SFM this year and changed my mind a little over a week before the race. This was basically the best decision ever - I had a fantastic day and ran really well! Leading up to the week of SFM, I was worried because my 50K training plan had burned me out pretty badly. I'd been feeling very low on energy and unmotivated on training runs. However, the idea of running SFM, which is my favorite marathon course, perked me up and I decided I should go for it. I mean, nothing else was making me excited to run anymore, what could it hurt? This decision was made a little over a week before the marathon, enough time for Coach Sarah to change my schedule for the weekend before from a 24 mile trail run to an 18 mile trail run. This gave me a little bit of a taper into SFM while still getting me out on the trail for one more long run. 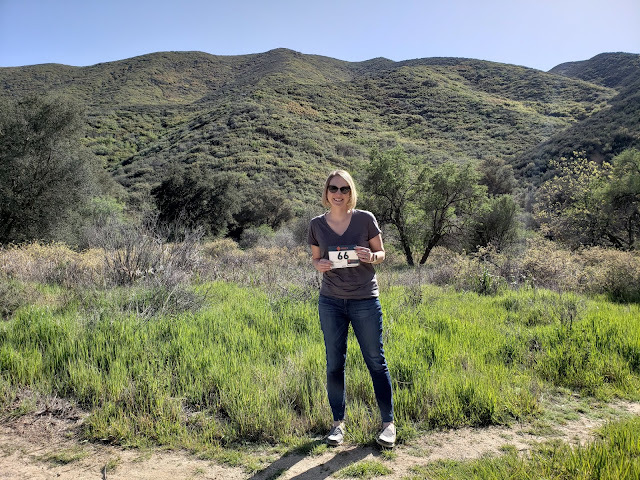 Road and trail running are obviously very different, so this was important for my training and especially my mental game. It had been a while since I'd been to a big race expo, so I was pumped to wander around and to see friends when we arrived. The SFM expo is always a fun one thanks to the location, exhibitors, local running stores, and food sample vendors that participate. After grabbing our packets and shirts (and 5 year loyal runner water bottle! ), I met up with a few Oiselle Volée ladies who would also be running the next day. Meeting up with Oiselle Volée ladies: Olivia, Kim, Sheena, and Jody. The rest of the evening we relaxed, had dinner and beer with our friend, Eddie, and went to sleep early. That 4:40 am wake up time would come quickly! 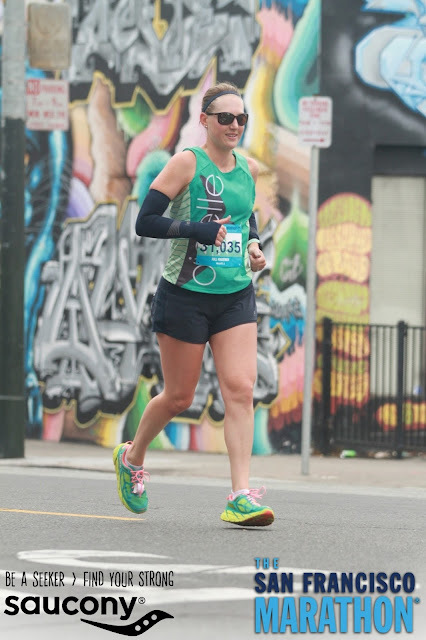 The next morning, I was really nervous and not convinced I could actually run 26.2 miles that day. The mental and physical exhaustion was still bothering me and my confidence was way down. Kevin was encouraging, and I told myself that if something went really wrong there was always the 1st half marathon finish line. That was somehow comforting. Our hotel was right by the staging area, and I wandered outside about 15 minutes before my corral was slated to start. I love staying so close; it's much easier for staying warm, not to mention avoiding porta potty lines and gear check. I found corral 3 and off we went. Early photo on the Embarcadero. The first few miles of the course are fun but generally flat and uneventful. The little-but-steep hill at Fort Mason felt easy, and that was a great mental boost. Another couple of flat miles passed by, and I found myself excited to get to the bridge approach so we didn't have to run flat anymore. The series of hills and grades - the bridge, Presidio, and Golden Gate Park - would remedy the flat running. Go Far was volunteering at the mile 5 aid station right before the bridge approach, and it was awesome to see everyone there. Thanks for the water and cheers, friends! Somewhere along Chrissy Field. Love the free photos! Finally, we hit mile 5.5 or so and started the hilly portion of the course. I focused on consistent effort and powered up to the bridge with no problem. Running across the bridge is my favorite, in part because I'm obsessed with the bridge and also because it's an out-and-back section where you can see everyone. I enjoyed many cheers, hellos, and high fives as I passed by friends. The Bay Area run community is awesome. Soon I was back across the bridge and facing the climb up to Lincoln Boulevard, one of my hill nemesis in the past. Thanks to all the ultra and trail training, this hill took much less effort than I expected. I kept reminding myself about a hill in Rancho that I use as a benchmark, and I knew all of the climbs on the SFM course were shorter. If I can run the whole Rancho hill, I could most definitely run anything on the marathon route. I continued to focus on consistent effort and not pace, and I found some confidence. Down my favorite hill along Lincoln Boulevard, more climbing in the Presidio, and into Golden Gate Park we went. I used to struggle in this part of the course and now I love it. I was particularly excited to get the 'alternate' course in the Presidio (this is how they mitigate traffic in some spots) because I've always gone the same way in the past. Ah, the little things! 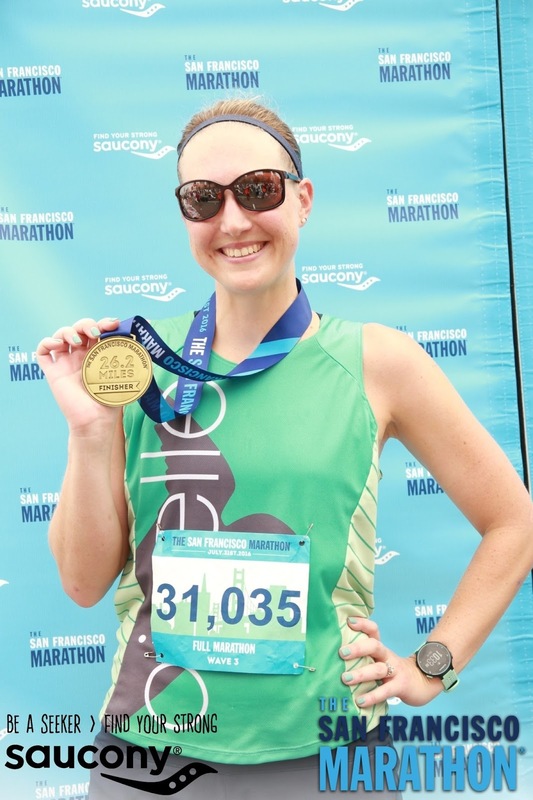 Last year, I struggled really hard in Golden Gate Park and had stomach issues. Luckily things went great this time around and I was able to enjoy it. We had few more out-and-back sections where I was able to say hello to friends, and we passed the half marathon finish line three times. 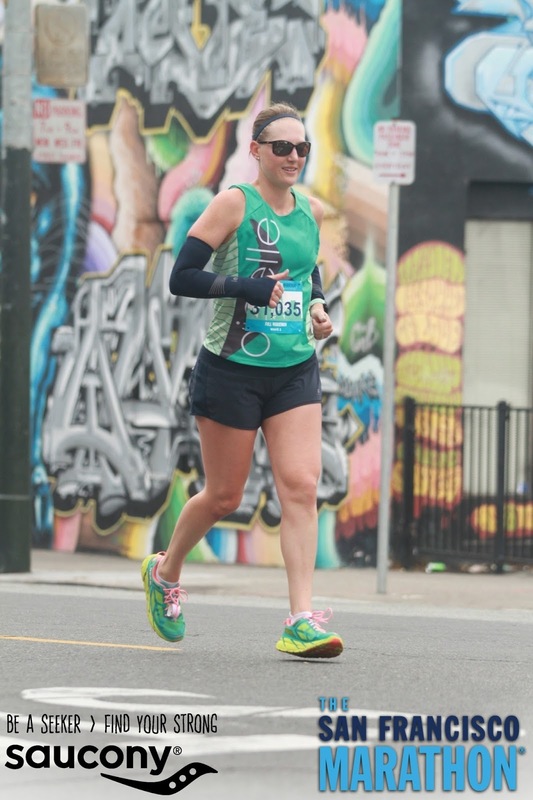 Why is it so hard to pass the half finish even when I don't feel the need to stop running? It plays with the brain. We popped over the last hill in Golden Gate Park and into Haight Ashbury, one of my favorite parts of the course. The energy in this neighborhood is always fun and it's nice to be back in the city. It feels like a fresh start - and it kicks off some fun downhill! The rest of the course is mostly downhill or flat with a couple of small hills, and I was able to speed up a little from there to the finish. I couldn't believe how great I felt and I was enjoying every minute. I hadn't been watching my pace very closely because this was a training run; if I had realized it sooner, I could have run a course PR with not much additional effort. 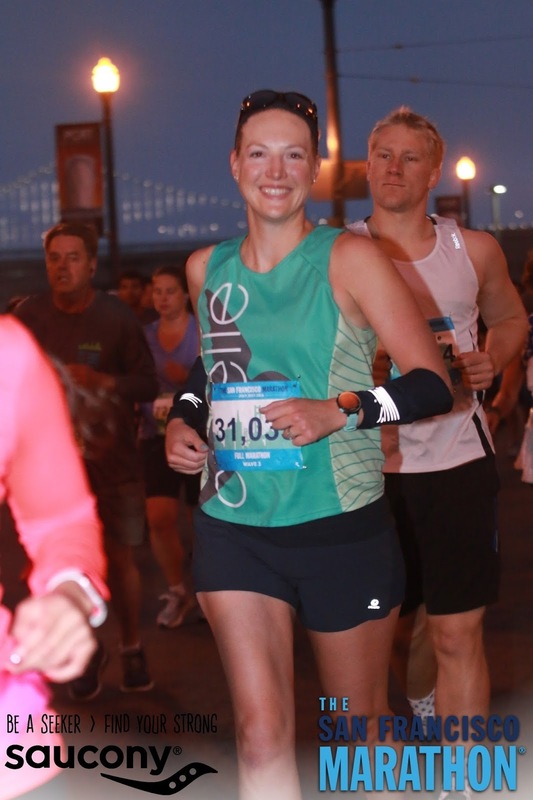 Soon we passed AT&T Park and merged on to Embarcadero for the finish. Finishing along the water with views of the Bay Bridge is fantastic, and I gave what I had left in the finish chute to cross the line at 4:39:55. 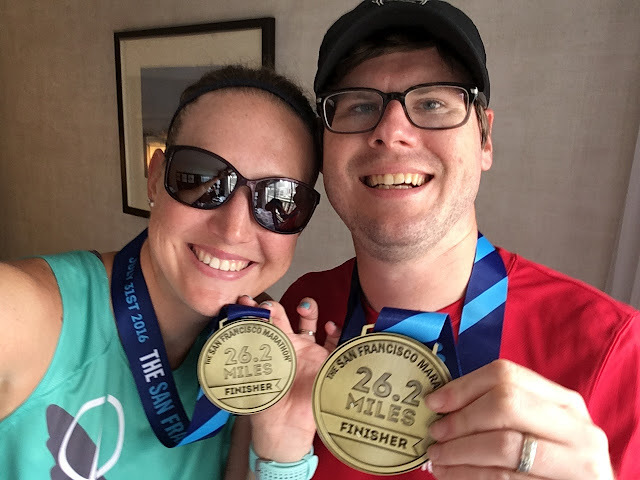 I was stoked to finish the SF Marathon for the second time and excited that I was only about one minute slower than last year. Even better, my splits were very consistent and I didn't walk aside from a few water stops. 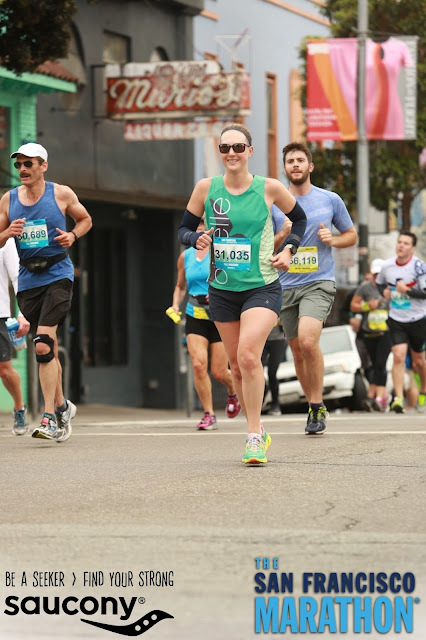 This was by far my most comfortable marathon - no struggle, no wall, all smiles. I'm definitely curious how I would have done if I had specifically trained for SFM as initially planned and not had a 4 hour long run the weekend before. That said, having a time goal for this marathon would have made it considerably less fun. I'm beyond thrilled at how well this turned out! Kevin and I showing off the medals. Swag! SFM shirts are my fave. Since SFM, I've been in taper and recovery mode for Tamalpa 50K. The training plan wiped me out more than I think it should have, perhaps due to ramping up too quickly in the beginning. I don't currently feel faster or stronger, and low energy/lack of confidence has been a big struggle for the past few weeks. Here we go, goal race week. 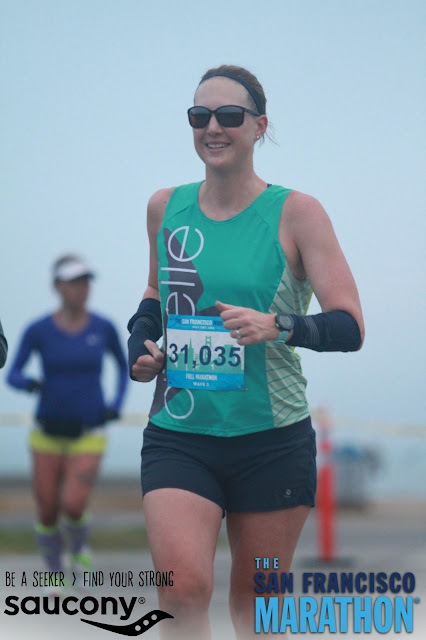 Congrats on a strong "training run"/another marathon finish! I'm sorry that you're feeling burned out before your 50K. On the brightside, you're heading in with modest expectations. Enjoy the day and your time on the trails! Thanks Jen - and you are right, low pressure is good. I know I'll enjoy the views! YES!! You most certainly CAN do this and you are ready; I'm looking forward to cheering you on (from a distance, but I'll be cheering!) this weekend!! Thanks Tara! :) I need it! Nice race!! I keep trying to psych myself up to run this full but uggggghh I just can't, between the price & how much I hate the second half of the course. Maybe some day! Thanks! :) I always sign up right away because I like to run the race, and the prices are so much better early bird. 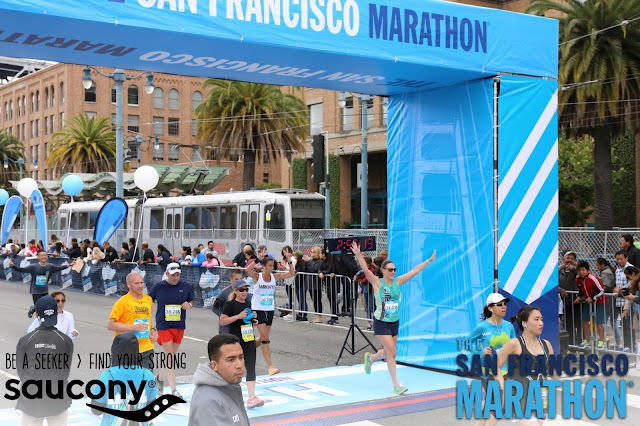 I paid $90 for the full marathon for 2017! Congratulation! Glad to hear your result! All your photos on this post are AMAZING, especially the first one! You totally rocked this!! !